Many of us love playing games so why not make them? Ever sat their playing a classic video game, and had the desire to make your own game? The follow article is a in-depth look into the starter year for studying a Games Design course in Scotland. 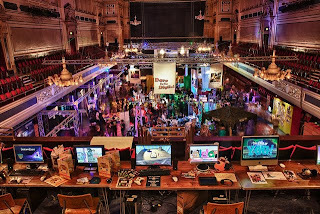 Abertay University is one of Scotland's leading universities for computer game related courses. It offers a wide-range of degrees including: Computer Arts; Computer Game Technology (CGT); and Games Design and Production Management (GDPM). I am currently in my second year at Abertay studying GDPM. The course is designed to turn young talented students into a Designer or a Producer by the end of the 4 (or possibly 5) years that the course runs. This article is an explanation of what the first year GDPM course entails along with my personal views and how I found it. The course is broken down into two semesters, the first from September-December/January and the second from January-April. The following will describe what is included in the first semester. The first semester of GDPM consisted of four modules: Audio for Computer Games; Pre-visualisation; An introduction to the games industry; and Programming in C++. There was a lecture and a tutorial for each of these classes every week. The first experience I had of the course was through the Programming in C++ tutorial, this was not the best of experiences. The tutor opened by showing us how to access the C++ program. He literally gave us a step by step guide of how to “Use your mouse to click on the start menu” until we got into the program itself. Judging by this level of teaching I was expecting to have every small detail of programming explained to me, which in all fairness I would have liked as I had no previous experience in programming (along with most of the course). This sadly wasn’t the case as after we got into the C++ program he told us to open a pre written piece of code and play around with it. For most of the GDPM course this consisted of changing the colours of whatever appeared on screen whilst watching on at people on different courses making things fly across the screen. Not the best start to uni life, however being on a course which is loosely focused on programming, we only needed a very basic understanding of how things worked. The coursework for the C++ module consisted of making a Sudoku puzzle which gave you feedback as you played. For example, if there was two of the same number in one box, column or row then an error message displayed. You also had to create a method for the user to navigate around the grid, either by the arrow keys or co-ordinate commands. Doing this would give you enough to pass the module. Programming was by far the most tedious part of the course however you only have to stud it in first year for one semester so it’s not that bad and gives you a certain respect for programmers. Moving onto one of my favourite parts of the course from last year, Audio for Computer Games. The coursework for this module was to add a full audio track to one of four muted game clips and to produce a digital sketchbook and short essay explaining the processes. As I love video game music I wanted to produce all the audio files myself. This required the use of a recording studio which we were lucky enough to have access to at Abertay. After a brief tutorial on how to use the recording studio I went about creating sound effects and voice clips for the project. A combination of Cubase and Soundforge was used to add the music (created in Cubase) and sound effects to the muted video file. The digital sketchbook was a folder full of sound effects which had been created or used in the final video clip. A document with references and links to inspiration was also included as everything in uni must be referenced to avoid any claims of plagiarism. I regard this as one of the best parts of first year GDPM mainly due to my love for game music. I had great fun doing it and I found the lectures and tutorials to be interesting, whereas in C++ I struggled to understand anything. This is the final product which should give you an idea of what we had to do. The third module, an introduction to the games industry, was the essay writing part of the course. The classes consisted of standard lectures from the tutor and guest lectures from people in the industry, including Tag Games and former Real-time Worlds employees. Only two essays were given out in the first semester. The first essay assignment was to choose a major event in the history of the games industry and evaluate it. The second essay was to critically evaluate a games developer however no more than one person could write about the same games developer. This meant you had to decide very quickly on which company you wanted to write about and then hope that no-one else has asked for it before you. Both essays were fun to write which made them easier to complete. The final module of the first semester was Pre-Visualisation. This is where the main game design aspects of the course happened. Each week we had a lecture and a 3D modelling class to help us along and show progress on a brief which was given out. The brief was to design an Xbox Live Arcade game which challenges the player to get from point A to point B in either single or multi-player modes. This unit was graded on three different sections which we had to complete. Part one was a development sketchbook where we had to produce a sketchbook to show visual development of ideas and concepts. This included everything from annotated level designs to controller layouts. Part two was the Pre-Visualisation portfolio. For this we had to produce a pitch document with logo and branding, mood boards, mock game screen shots and an animated playblast. The latter two were rendered out from the 3D modelling package Maya. The final part was a reflective essay where you analysed the aims, intentions and processes undertaken during the development of the portfolio. You had to detail the successes and challenges encountered and state if you had met all the goals you set out. This module was the most content heavy but was extremely fun to work on. Although you don’t create a working game from your idea, having a chance to create screen shots, a pitch document and an animation of how the game would play was great. That brings me to the end of Semester one and the end of the first article. Look out for the second half in the near future on Confab!